One phrase, two very different Christmas postcards. The first was sent in 1915 from Netley hospital, a military hospital near Southampton used extensively during World War One. The second is from a parlour somewhere near Willesden two years earlier. Of late, I've been reading Jacques Derrida's 'The Post Card'. 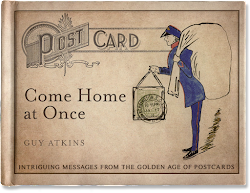 The work documents the philosopher's thoughts on the essence of a postcard, and is perhaps relevant to the two cards above: how they both use the same phrase but in such different circumstances. It's a slippery text, written as a satire of literary works involving letters. In it, Derrida comes across some postcards in the gift shop of the Bodleian Library in Oxford. He explains how he's captivated by them, and then uses the sending of the cards to mock the limitations of language. He pokes fun at the idea of ever being able to understand what someone means through words, obsessing with double meanings and how what words refer to can shift over time and between contexts. If you're in the mood, it's a mesmerizing piece of writing. If you're not, it's like pulling teeth: a friend once told me you only ever grasp one sentence a page with Derrida, and that's if you actually are Jacques Derrida. But regardless of how much you feel you're grasping, there's something brilliant about where you end up by reading his work. Its deliberate obscurity and deferral of meaning present a welcome challenge to blind certainty, to unqualified rhetoric, to unchecked power. Thanks for everyone's comments, postcards and emails over 2013. They're really appreciated. And wherever you are, I hope you have a peaceful and happy time over the holiday period. PS I've noted the possibility of Vine videos sending you mad before so be careful not to look at the two above for too long. I do like postcards .. easily collectible for their wonderful photos or for memories or just because! I promise not to watch too long! Happy PFF. Merry Merry and a Happy Happy. Hi Guy, thanks for this interesting post. Best wishes for 2014 to you too and happy PFF! What a novel way to share postcards! I love it! lol I was thinking, as I read your wonderful narrative, wondering what Derrida would think of "tweeting!" LOL I imagine he would have a whole lot to say. Thank you so much! Merry Christmas and Happy Postcard Friendship Friday! I'm afraid I wouldn't understand or enjoy Derrida. Hope your holidays are happy. I am assuming that Netley Hospital was full of WWI wounded, judging by the date this one was sent? Thanks VioletSky. I've now put a link to wikipedia for more details on the hospital. Postcardy - give it a go, once you start he's hard to put down. Beth - it would blow his mind, I'm sure! And great to hear from you Snap and Paul.